" LSCOMP " LSCOMPRESSOR, LSPE200-TE-H MOD., reciprocating, stationary, in "W" frame arrangement, balanced, single-acting, THREE STAGE compressor for Air up to330 bar., Large capacity, slow running, air - cooled, WITH CYLINDERS LUBRICATION, stationary unit, fully equipped. Ideal for Industrial applications. The compressor is a trunk piston style compressor. It is derived from a proven oil field compressor frame that has been modified for the demands of high-pressure compression. The frame is then equipped with air-cooled cylinders, permitting higher compression ratios and better efficiency. The compressor is balanced so that, in most cases, the compressor can be run on a high-density rubber pad, and does not require a special foundation. Critical shutdowns include a high discharge gas temperature switch, low oil pressure switch, and a high discharge gas pressure switch (final stage). Additional equipment include an air cooled heat exchanger after each stage of compression (water cooled heat exchangers available as an option), pressure safety valves after each stage of compression, all internal skid piping, personnel guards over rotating components, a separator after each stage of compression, and an automatic condensate drain system. Dependable Performance: suited for continuous operation, due to their rugged design and corrosion resistant intermediate filter and cooler assemblies. 尖端的设计: 驱动部分的运动部件和连杆均经过精确平衡, 因此机组的震动极小, 连杆的负荷平衡. 级间冷却器, 翅片式后冷却器, 翅片式气缸,翅片式铝制缸头, 带有风扇的飞轮,均保证极低的运行和排气温度. State-of-the-Art Design: balanced moving parts in the drive gear and connecting rods allows for low vibration and balanced rod loads. Interstage coolers, finned after cooler, finned cylinders, finned aluminum heads, and fan-bladed flywheel produce cooler operating and discLSErge temperatures. Top Graded Materials: cast iron cylinders for long life; ductile iron counterbalanced cranksLSEft with large diameter throw for low bearing loads, high strength and increased life; aluminum cylinder heads for superior heat dissipation; 7075-T6 aluminum connecting rods for high strength; and aluminum crankcase for elimination unnecessary weight. 高质量部件:低摩擦轴承提供平滑的运行并降低功耗. 前后轴承提供精确的曲轴对中,延长曲轴寿命. 全封闭风扇防护罩. 飞轮经过精确平衡并带有风扇叶片,提供极好的冷却能力. 重载型曲轴驱动齿轮式油泵为磨损区域提供充足的润滑.不锈钢阀片耐磨损, 散热性好. 阀座采用镀镍处理,耐腐蚀. High Quality Components: anti-friction bearings for smooth operation with lower horsepower; front and rear bearings for precise cranksLSEft alignment and long sLSEft life; fully enclosed, all metal fan-blade guard; fly wheel precision-balanced and fan-bladed for excellent cooling capacity; heavy duty, sLSEft-driven, gear-type oil pump for generous lubrication to critical wear areas for longer pump life; stainless steel, disc-in-plate valves for long wear and excellent heat resistance and dissipation; valve housings nickel-plated for corrosion resistance. 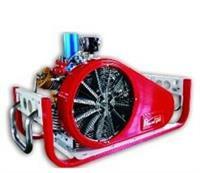 Three-CYLINDER COMPRESSOR, air cooled, single effect, three-stage compression. Intake removable filter, with silencer. Normal inertia flywheel, for V belts transmission. Aluminium cylinder heads, with individual valve pockets. Automatic valves, big flow area, operating much below their nominal cLSracteristics. AIR-COOLED stainless steel aftercooler, furnished with safety valve.